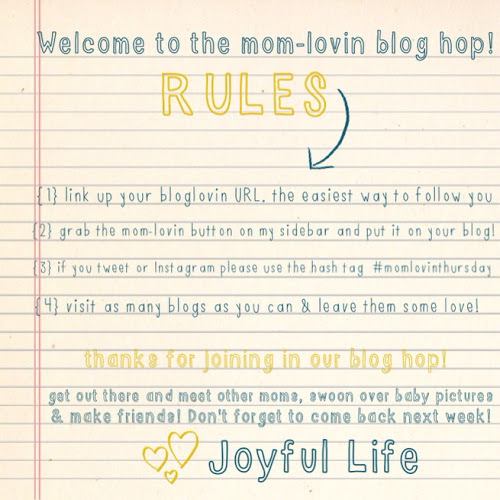 I had so much fun meeting new friends last week while co-hosting Joyful Life's blog hop with Fawn Over Baby that I of course accepted to co-host a second week! If you haven't met Hannah from a Joyful Life and Melissa from Fawn Over Baby I invite you to head on over to their places and get yourself acquainted. These mama's are lovely, strong woman who are nothing short of inspiring and enjoyable. Don't forget to grab a button and follow your host and co-hosts! I'm happy you did too but it helped me find you! Oh no worries! The party remains open for a few days so you are just in time! :) Love the plug, sounds delightful. Happy to find your blog through the link up on Melissa's site! Love your blog design and can't wait to read through your posts! Thanks Whitney! Glad you found your way here too! Thanks for doing this Lena! I love to visit your blog because I feel like I am in a shabby chic flower patch or something:). It is so cute! That's so sweet of you to say Tiffany! Thanks for the encouragement. I am finally really liking the look of this little space- it has been a long time coming with a lot of learning over the last two years. It's assuring other's are enjoying it as well!